Workers are cleaning up a two-acre site in the Prudhoe Bay area of Alaska. WASHINGTON, March 14 — The largest oil spill to occur on the tundra of Alaska's North Slope has deposited up to 267,000 gallons of thick crude oil over two acres in the sprawling Prudhoe Bay production facilities, forcing cleanup crews to work in temperatures far below zero to vacuum and dig up the thick mixture of snow and oil. The spill went undetected for as long as five days before an oilfield worker detected the acrid scent of hydrocarbons while driving through the area on March 2, Maureen Johnson, the senior vice president and manager of the Prudhoe Bay unit for BP, said at a news conference in Anchorage on Tuesday. At the conference, officials from BP, the company pumping the oil, and from the Alaska Department of Environmental Conservation said they believed that the oil had escaped through a pinprick-size hole in a corroded 34-inch pipe leading to the Trans-Alaska Pipeline System. The pressure of the leaking oil, they said, gradually expanded the hole to a quarter- or half-inch wide. Most of the oil seeped beneath the snow without attracting the attention of workers monitoring alarm systems. The leak occurred in a section of pipe built in the late 1970's, in the earliest days of oil production at Prudhoe Bay. The larger pipeline, which carries North Slope oil across the state, was completed in 1977. 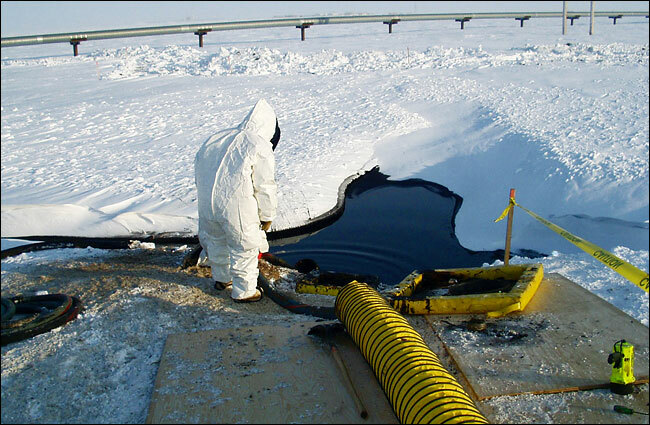 Environmental groups were quick to point out that the spill raises doubts about the continuing reliability and durability of the infrastructure of North Slope production. The current spill is among the worst in the pipeline's history, and the first of such a magnitude likely to be blamed on the decay of the aging system. In 1989, about 11 million gallons fouled Prince William Sound after the Exxon Valdez tanker ran aground. About 700,000 gallons escaped from the pipeline after vandals blew up a section of it in 1978, and about 285,000 gallons spilled in 2001 when a hunter shot the pipeline. Corroded pipe leads to the Trans-Alaska Pipeline System. Asked later on Tuesday about how company and state officials arrived at their tentative conclusions about the cause of the spill, Ms. Johnson said investigators had "looked at the leak investigation system, at all the logs and all the charts" that measure oil volume and pressure at different times and in different areas. At the news conference, Ms. Johnson said that although routine inspections last year indicated increasing corrosion in the pipe, the severity of corrosion found since the leak pointed to a swift and sudden deterioration. "We had no reason to expect" that this pipe, which carried 100,000 barrels of oil to the Alaska pipeline a day, "was going to leak," she said. Ms. Johnson also said the leak was "smaller than our system would detect," adding that it was "still not acceptable to BP." The normal fluctuations of oil flow in this particular pipe could have masked warning signals, state environment officials said.